6/8 Boulevard de Douaumont 17th Arr. 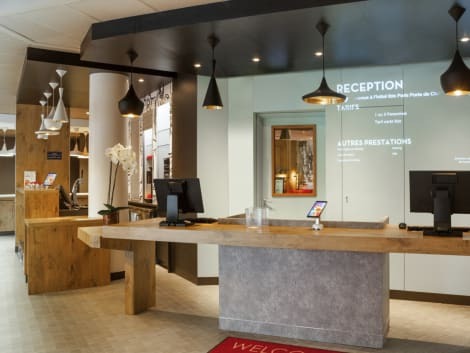 Situated in the north of Paris close to the Stade de France, the 3-star Hotel Median Paris Congrès is an ideal destination for both business trips and weekend breaks to the city. The smart air-conditioned rooms feature paid wi-fi access, flatscreen TVs and private bathrooms. Paid parking is available directly from the hotel and the reception is open 24-hours a day. Relax in the evening with delicious French cuisine at in Le Bistro restaurant and a glass of wine in the garden terrace. Renovated in 2017, with a cozy, stylish feel, our boutique hotel of 53 rooms has all the facilities and services you need to make your business trips or vacations a success. Relax or work with ease thanks to our free WIFI: this is how we offer welcoming accommodation. Satisfy your appetite with French cuisine at La Terrasse de Berthier, a restaurant which features a bar and a garden view. Dining is also available at the coffee shop/café. Buffet breakfasts are available daily from 6:30 AM to 10 AM for a fee. 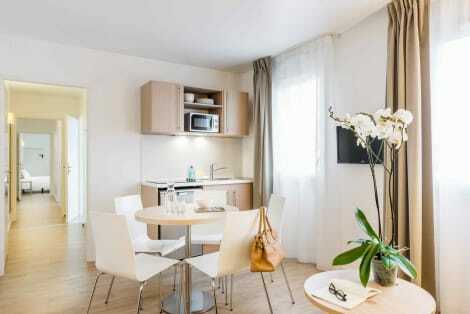 MOB HOTEL Paris Les Puces is found in Saint-Ouen, within walking distance of the Garibaldi Metro Station. The hotel has a garden, 24-hour front desk and a library, while additional amenities like giant table football and pop-up stores are offered for your entertainment. The hotel has free wi-fi, and rooms offer smartphones with internet, air conditioning and private bathrooms stocked with complimentary organic toiletries. Grab a bite from the snack bar/deli, or stay in and take advantage of the hotel's 24-hour room service. Wrap up your day with a drink at the bar/lounge. Buffet breakfasts are available daily for a fee. This residence was built in 2009. 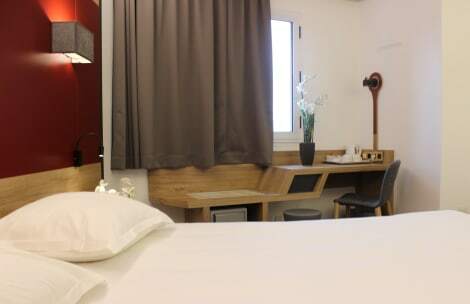 The ibis Paris Porte de Clichy Centre, accessible by Metro 13 (Porte de Clichy) & RER C, is close to the new Paris TGI courthouse, near Montmartre, and 10 min. from Clichy center. Completely renovated, it has 124 air-conditioned rooms, an "Ibis Kitchen" restaurant with buffet, 24-hour bar, unlimited WiFi, Web Corner and private covered parking lot with an adapted service for mobility-impaired persons. Breakfast and unlimited WIFI included in all rates at the ibis Styles Paris Mairie de Clichy. This hotel is ideal for cultural and business trips alike. Located 55 yards (50 m) from the Mairie de Clichy stop on metro line 13, which will get you to the center of Paris in 10 minutes. 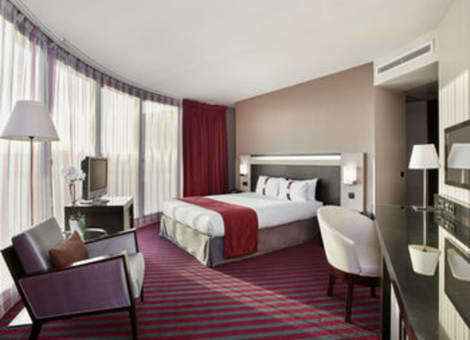 The hotel is within easy reach of all the business districts in northwest Paris. With an array of restaurants and stores close to the hotel, make the most of everything Paris has to offer, with peace and quiet too. Holiday Inn Paris - Porte de Clichy hotel is located in Paris' northwestern gateway district at the center of “Grand Paris” project, an area where many international companies and future Judicial Precinct are located. Underground parking is available for up to 58 cars at a low daily cost. It's a seven-minute walk from the hotel to Porte de Clichy metro station. Metro line 13 takes you to the Champs-Élysées and shopping centres such as Les Grands Magasins in 12–20 minutes. The white domes of the basilica of Sacré-Coeur and the artists' quarter of Montmartre are a 15-minute bus ride from the hotel. Essential sights like the Louvre and the Eiffel Tower are also less than 20 minutes away. Buses and RER trains get you to key business districts including Villepinte,Porte Maillot, and the Palais des Congres, Paris' main congress and conference venue, in 10 minutes. The hotel offers a shuttle service to the offices of major companies located nearby. Business guests can host events for up to 170 at the hotel's adaptable function spaces. Revitalise yourself at the hotel's fitness centre, which offers a range of equipment. There's inclusive Wi-Fi throughout the hotel, with ultra-fast internet access. Consider bringing the family – kids stay and eat free. lastminute.com has a fantastic range of hotels in Clichy, with everything from cheap hotels to luxurious five star accommodation available. We like to live up to our last minute name so remember you can book any one of our excellent Clichy hotels up until midnight and stay the same night.